Successfully Added FreeScan Cordless Handheld Scanner to your Shopping Cart. Capable of turning any print materials into digital files, this handheld scanner makes preserving important files, receipts, and any other documents easy! Digitizing newspaper snippets, business cards, and receipts is fast and easy with this Cordless Handheld Scanner. 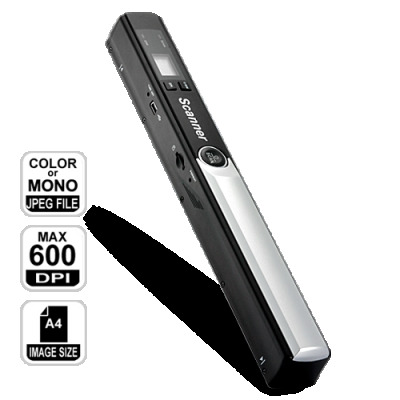 Just move the scanner over an area and its sensitive color image sensor scans at high (600 DPI) or standard (300 DPI) resolution, saving images onto a microSD card for easy retrieval. Photos, business cards, books, newspapers, magazines, receipts, notes - the FreeScan Cordless Handheld Scanner is great for everything! No more worrying about getting documents dirty or damaged, no more worrying about misplacing or losing papers. With the FreeScan Cordless Handheld Scanner, everything is digitized, everything you scan is saved onto a micro SD card for future use! Best of all, all this can be done on your own within just a few seconds! So instead of spending more than $30 to scan a book, why not buy this handy and easy to use scanner at our factory-direct price for endless scanning? With its low wholesale price, it’s also a perfect resale item. It’s available in our warehouse now for immediate shipment worldwide. Also comes with our famous 12 month product warranty. Brought to you by the leader in wholesale electronics, Chinavasion.